‘Secretarial Audit’ has been introduced by recently enacted Companies Act, 2013. It is a process to check compliance made by the Company under Corporate Law & other laws, rules, regulations, procedures etc. It is a mechanism to monitor compliance with the requirements of stated laws and processes. Periodical examination of work is necessary to point out errors & mistakes and to make a robust compliance mechanism system in an organization. Every company needs to comply hundreds of Laws, rules, regulations. These laws are complex and non-compliances would attract major risk to company. Periodically inspecting the records of company gives exact information whether, and if so, to what extent Company has complied with the laws applicable to the Company. 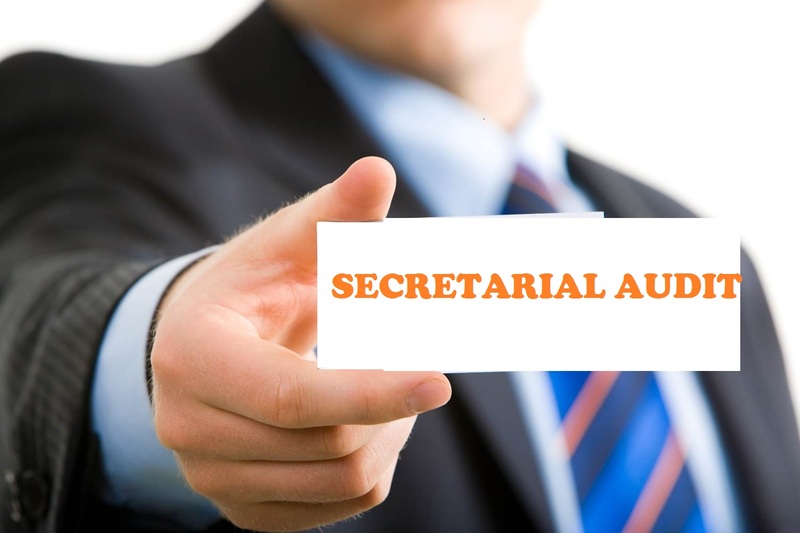 Only a member of the Institute of Company Secretaries of India holding certificate of practice (company secretary in practice) can conduct Secretarial Audit and furnish the Secretarial Audit Report to the Company. WHICH COMPANIES ARE REQUIRED TO APPOINT SECRETARIAL AUDITOR? Every public company having a turnover of Two Hundred Fifty Crore rupees or more. As per Rule 8 of the Companies (Meetings of Board and its powers) Rules, 2014, Secretarial Auditor is required to be appointed by means of resolution passed at a duly convened Board meeting and resolution for appointment shall be filed with Registrar of Companies within 30 days in E-form MGT-14. It is advisable for Secretarial Auditor to get the letter of engagement from the company. Secretarial Auditor should formally accept the letter of engagement. Further, as a prudent corporate practice, it is advisable that change in the Secretarial Auditor during the year is reported to the members in the Board’s Report. Secretarial Standards issued by The Institute of Company Secretaries of India. Reporting on compliance of ‘Other laws as may be applicable specifically to the company’ shall include all the laws which are applicable to specific industry for example; for Banks- all laws applicable to Banking Industry; for insurance company-all laws applicable to insurance industry; likewise for a company in petroleum sector- all laws applicable to petroleum industry; similarly for companies in pharmaceutical sector, cement industry etc. Examining and reporting whether the adequate systems and processes are in place to monitor and ensure compliance with general laws like labour laws, competition law, environmental laws etc. The Board of Directors of the Company is duly constituted with proper balance of Executive Directors, Non-Executive Directors and Independent Directors. The changes in the composition of the Board of Directors that took place during the period under review were carried out in compliance with the provisions of the Act. Adequate notice is given to all directors to schedule the Board Meetings, agenda and detailed notes on agenda were sent at least seven days in advance, and a system exists for seeking and obtaining further information and clarifications on the agenda items before the meeting and for meaningful participation at the meeting. Majority decision is carried through while the dissenting members’ views are captured and recorded as part of the minutes. There are adequate systems and processes in the company commensurate with the size and operations of the company to monitor and ensure compliance with applicable laws, rules, regulations and guidelines. Moreover Secretarial Auditor is required to report and provide details of specific events and actions occurred during the reporting period having major bearing on the affairs of the Company pursuant to above referred laws/ rules & regulations. Few events were also given as example in the format of audit report. However in case of financial laws like tax laws and Customs Act etc., Secretarial Auditor may rely on the Reports given by Statutory Auditors or other designated professional. The Companies Act, 2013 has empowered secretarial auditor and has given him all rights and powers as given to statutory auditor. As per section 204 of the Companies Act, 2013, the secretarial auditor company shall be entitled to require from the officers of the company such information and explanation as he may consider necessary for the performance of his duties as auditor. Sub-Section 4 of Section 204 of the Companies Act, 2013, provides that if a company or any officer of the company or the company secretary in practice, contravenes the provisions of section 204 of the Act, the company, every officer of the company or the company secretary in practice, who is in default, shall be punishable with fine which shall not be less than 1 lakh rupees but which may extend to 5 lakh rupees. Moreover as per sub section (15) of section 143 of the Companies Act, 2013, if a secretarial auditor, has reason to believe that an offence involving fraud is being or has been committed against the company by officers or employees of the company, he shall immediately report the matter to the Central Government within such time and in such manner as may be prescribed. Failure to do so shall attract a fine which shall not be less than 1 lakh rupees but which may extend to 25 lakh rupees. he shall be liable under section 447. Section 447 deals with punishment for fraud which provides that any person who is found to be guilty of fraud, shall be punishable with imprisonment for a term which shall not be less than six months but which may extend to ten years and shall also be liable to fine which shall not be less than the amount involved in the fraud, but which may extend to three times the amount involved in the fraud. In case, the fraud in question involves public interest, the term of imprisonment shall not be less than three years. In terms of Section 448, a Company Secretary in Practice is liable to attract penal provision if, he makes statement in the Secretarial Audit Report which is false is any material particulars, knowing it be false or omits any material fact knowing it to be material. c. fine which may extend to one lakh rupees. c. fine which may extend to five lakh rupees. Note: Kindly note that the entire contents of this article have been developed on the basis of relevant statutory provisions and as per the information existing at the time of preparation i.e. Act, notification, clarifications & circular issued by MCA. Though we have made upmost efforts to provide authentic information, however we do not undertake any liability in any way whatsoever, to any person in respect of anything arising by reliance upon the content of this article. It shall not be used as a legal opinion and not to be used for rendering any professional advice.